Unsurprisingly, Limerick man Josh Sheahan’s interviews on the UK racing channel earned rave reviews. JOSH SHEAHAN IS the proud owner of the Top of the Town pub in Askeaton, Limerick. He owns a horse by the same name. Top of the Town – the Equidae version – ran the 3:40 Michael English Country Music steeplechase in Sheahan’s home county yesterday. The gelding’s trainer, Charles Byrne, had twice tasted victory earlier the same afternoon, and Top of the Town entered his own race in fine fettle; he’d won three of his last six outings, including the Novice Chase in Tipperary in May, as well as wins in Roscommon and Bellewstown last summer. 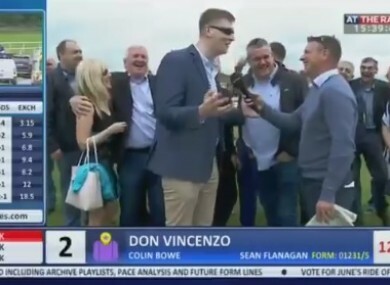 Sheahan was understandably bullish about his horse’s chances, and gave the following pre-race interview to At The Races, who caught up with the sunglasses-clad Limerick man and his crew. “If this horse wins, let me tell you, we will wreck the shop! We will wreck Limerick Racecourse if he wins,” was Sheahan’s ominous proclamation, before he was asked about the celebrations following ‘the Town’s win in Tipp. In spite of Sheahan labeling Top of the Town “a certainty” while imploring At The Races viewers to “get on now,” the nine-year-old bay gelding finished 17-and-a-quarter lengths behind Baily Moon, trained by Mouse Morris. The owner had ditched the shades, and was in more sombre form after his horse’s fifth-place finish in a field of eight. “What went wrong? I don’t know,” he told At The Races. We’ll go back now to the Top of the Town. I’m pleading with ye here tonight, live on television. As many as ye can, will ye come to the Top of the Town and spend a few pound? Because I’m after losing a rake of money here today. Denny Gould is going to go home in a new suit and a new car and everything from me. Email “'There was holy war over it - she left him! ': Irish horseowner steals show on At The Races”. Feedback on “'There was holy war over it - she left him! ': Irish horseowner steals show on At The Races”.